Are you vaping in TP mode? What are your settings (Temp, wattage, preheat, punch, duration) on the 75 and what are your settings on the SX M? What is the cell soft cut-off of the SX M and what do you have the cell soft cut-off set to on the VT75? I do not see significant differences in the shed between the two batteries . The 23A Efest versus 25A Sony are not significant when the mod does not exceed 12A. With an efficiency factor of 85% only involve 14.12A , enough safety margin in both batteries. I tried to approach the SX POWERFUL. And I see that the shed is softer, but not yet know how it will affect the battery life. First, the 35 amp Efest battery discharges 75% faster than the 20 amp Sony battery. So, you can't expect the same results. Even with the 26650's larger capacity, it won't last as long. Second, I don't think that a comparison of the quality of Chinese electronics - which are inferior in all respects to their Japanese and American counterparts, is ignorant, or disparaging, in any respect. It is simply a fact. I most certainly know where Europe is. And I have seen Chinese owned shops in Venice inundated with counterfeit Murano Glass, "Italian" leather goods, and all were of inferior quality. Much like the counterfeit designer handbags that the Chinese have to offer in NYC. There are 2 failures of our education system: one is producing the flag-waving, American First Trump supporters. The other failure is the smug, dogmatic PC a-holes, with their "trigger warnings", and "safe spaces". I don't know which is worse. 2.- Mira que estoy harto de los tópicos racistas sobre la electrónica China. ¿Me lo demuestras con datos contrastados y no con opiniones sesgadas? How are you fitting an 18650 in a 26650 battery terminal? Rubber bands, wrapped around the center? Also, how are you fitting a 26650 into a mod that is designed to hold 18650's? You should think of the actual objects that you are discussing, instead of just offering a conceptual, what if scenario, that doesn't translate to nuts and bolts reality. I had no idea that technological inferiority was genetic. How horrible of me to mention it. Also, I was unaware there were any racial distinctions that can be made between someone who is Japanese, and someone who is Chinese. I was also unaware of race, (if there is such a thing) being genetically traceable. Again, I am a monster. Good thing you're in Europe. They aren't allowed to use Google Translate in the PRC. They're too oppressive. Efest isn't a reliable brand. I would stick with Sony, Samsung, or LG. Efest aren't safe to use in your mod, really. DNA 75's pull more than 25 amps, which is the real rating for their 40 amp batteries, according to Mooch. Recently, I asked a question about changing the power settings, and was told that the DNA 200 is 23 max and pulse amps, and the DNA 75 was 28 amps continuous, and 32 max pulse. So, your estimate of 12 amps for your mod is way off. You are pushing the battery over its true capacity when you vape. I would imagine that the 26650 would vent more gas than an 18650, due to both surface area increase and stored power capacity. If you aren't getting the vape hours you were expecting from the 26650, it is probably due to the battery loosing power to heat. Not a good thing. At the very least, it will shorten the useful life of the battery. I think a screen shot of Device Monitor showing battery sag while firing at 50 watts would go a long way here at determining the problem here. I use a SMY75 with LG HD2 18650 that fires at 40 watts/50 watts preheat 1 second and have no complaint regarding battery life. If there are connection problems between the battery and board or weak battery this can be seen by the sag. I see no mention of the condition of the batteries being used. How they are stored, charged and discharged and how many cycles along w/age can all have a major effect on how they perform. FWIW, my results are here. 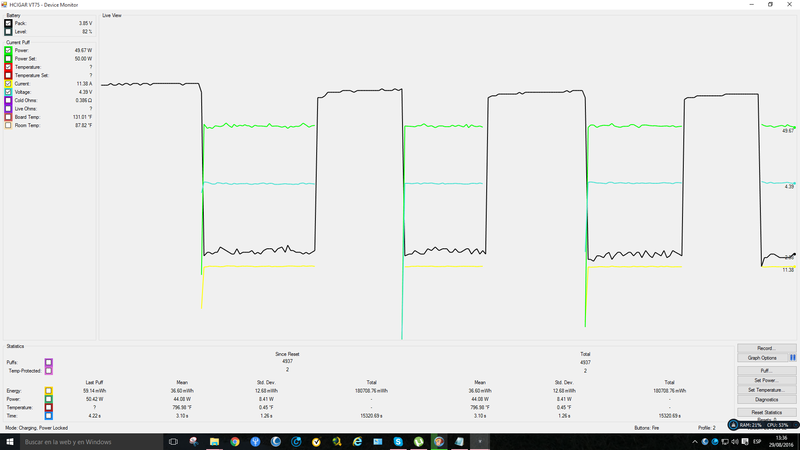 I have repeated the results and even using a Panasonic NCR 18650PF cell, I get run times comparable to- if not better than- what I get from an Evic VTC Mini using similar TC settings and resistance. All good points. I don't use any 18650's for vaping longer than 6 months. And I never leave them in my DNA 40's, after they show the power level dropping on the battery indicator. Once it drops from full charge on the board icon, it's at 3.6 volts. 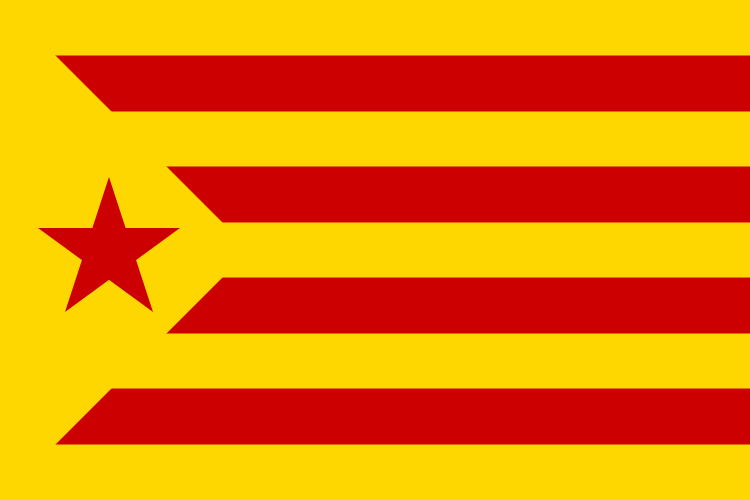 !Viva Catalonia, seti5! ¡Viva Marte con Fobos y Deimos incluidos, txmonkey214! Sé perfectamente que Efest re-etiqueta otras baterías. Por eso investigué para encontrar una buena batería que alguien hubiese verificado a fondo. Creo que ECF y Mooch están suficientemente contrastados como para confiar en sus análisis. Sony, Samsung y LG no tienen baterías 26650 de alta capacidad y que den al menos 20A. Y, o ya no vale la Ley de Ohm, o con resistencias del orden de 0.35Ω no se necesitan 25A para nada. R=0.39Ω - V=4.39 - I=11.7A en el atomizador. Incluso suponiendo un voltaje real de la batería de 3.5v (y a ese voltaje, el mod ya indica "week battery"), eso me da 14.68A con una eficiencia del 85% --> 17.26A en el lado de la batería. No uso coils de 0.1Ω, así que ¿donde está el problema? Se que se asumen muchas cosas, pero creo haberme tomado la molestia de comprobar las que puedo. Por cierto, en mi MOD, con EScribe, el límite de la batería está fijado a 23A. Y otra cosa que no me gusta nada del chip es que efectivamente se calienta, pero no es por la EFEST, ¡más quisiera yo!. Es que se calienta con la VTC4, la VTC5, la VTC5A, la LG HG2... y la Efest. Y un últimos detalle, la mitificada Sony VTC5, según su datasheet es de 30A solo si se emplea en un dispositivo que corte si se alcanzan los 80ºC. Si no tiene ese control, Sony la rebaja a solo 20A. ¡Que curioso! I am aware that Efest rewrap other batteries. So I researched to find a good battery that someone had checked thoroughly. I think ECF and Mooch are sufficiently tested to trust their analysis. Sony, Samsung and LG 26650 batteries don't have high capacity at least 20A. And, or not worth Ohm's Law, the order of 0.35Ω resistors no need 25A for anything. R = 0.39Ω - V = 4.39 - I = 11.7A in the MOD. Even assuming an actual battery voltage 3.5v (and that voltage, the mod already indicates "week battery"), that gives me 14.68A with an efficiency of 85% -> 17.26A on the side of the batería. No use coils of 0.1Ω, so where is the problem? It assumed many things, but I think having taken the trouble to check I can. By the way, in my MOD, with write, the limit of the battery is set to 23A. And another thing I do not like the chip is actually heated, but not by the EFEST, the more I wanted !. It is heated with VTC4, the VTC5, the VTC5A, the LG HG2 ... and Efest. And a last detail, Sony myth VTC5, see the datasheet, is 30A only if used in a cutting device 80ºC are achieved if. If you have no such control, Sony rebate only 20A. What curious! At the red arrow...it is 3.61 volts. This is with a LG HD2. Firing for 5 seconds.